Renowned Kashmiri leader Chaudhary Noor Hussain, 97, died Sunday morning after prolonged illness. 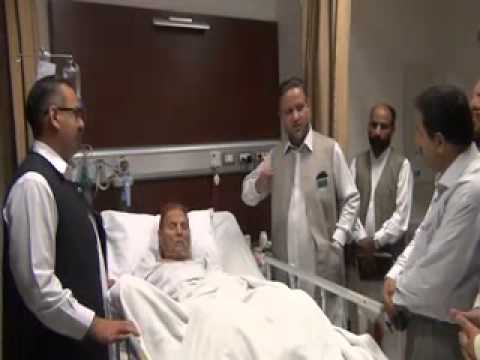 Noor Hussain, one of the pioneer leaders of the Kashmir freedom movement and father of Barrister Sultan Mahmood Chaudhry, former prime minister of AJK, was bed-ridden since past many years because of his serious illness. He was the elder brother of late Chaudhry Khadim Hussain, the four-time elected member of the AJK legislative assembly and uncle of Arshad Hussain, sitting member of the AJK legislative assembly and the former minister. Being an active worker of Kashmir freedom movement, late Chaudhry Noor performed a significant role in the freedom struggle before and after 1947 until fell bed-ridden due to illness. He remained as a member of working committee of the Muslim conference before and after 1947. He was laid to rest in his ancestral graveyard at Khari Shareef in his native village Chachian in Mirpur district Sunday afternoon in presence of thousands of mourners from all the segments of the society.